House fires and even a smokey fireplace can leave your clothing smelling like smoke. This is a guide about removing smoke smell from clothing. Several years back we had a fire in our home and the pros came in to help us with the clean up. Everything smelled like smoke, even our clothes. One of their cleaning secrets was to put one can of Coca-Cola in the washing machine, per load with your regular laundry soap. They said: "Do NOT use sugarless and do not use Pepsi, just regular name-brand Coca-Cola." It worked wonderfully! It was amazing how well just adding one can of Coke per wash load would take out every trace of smoke smell from our clothes and other washables! I've since used this trick to get rid of that campfire smell from my jackets and other clothes after camping and it also seems to get rid of nasty nicotine smells from my clothes when I've been around smokers. I don't know if a knockoff brand of Coke would work, I used the real thing but you could always give a cheaper brand a try! Source: Professional smoke damage cleaners gave me this tip. I need to clean a white dress that has been hanging in my closet and has smoke damage from the fireplace. Any suggestions? Try using white vinegar in the laundry. This will take out any residue of smoke in the clothes. We had a house fire and the insurance company sent in the pros in to help us with smoke damage. 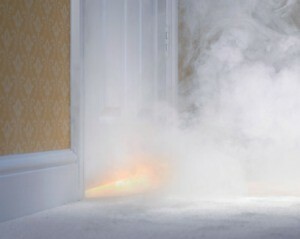 The first thing they did was hook up a huge ozone machine to remove the smoke smell from the carpeting and furniture. But when it came to clothing and other machine washables, they told us to pour one can of regular Coca-Cola (with sugar, not diet) into the wash with each load and it worked! All of the nasty smoke smell came out of our clothes. This also works with camping clothes and even with clothes from cigarette smokers. If you can't wash your item in the machine, try Vanilla Febreze. It has a light scent that's not overwhelming. Be sure to spray the front and back then turn the garment inside out & do the front & back again, then hang dry. If you can get your hands on a good ozone based home air cleaner then that's the ticket! Run the ozone based air cleaner in a small room (like a bath room) with your dress hanging from the shower bar. Please give me some advice on how to get rid of smoke smell (from a house fire) from my clothes. I washed them about 4 times already and the scent of the smoke is still there. I would add a product called Nok-Out. You can get it on Amazon. Mary Hunt from Debt-Free Living talks about it all the time. I also recommend Nok-Out but until you can order ti there are some other solutions to try. Very important: Do not dry clothes in dryer until all smoke odor is gone as it will be almost impossible to remove as the dryer "sets" the odor. Nok-Out may still work but questionable. The Red Cross recommends adding 2 cups of Scope mouthwash and wash through two cycles of wash. Use warm wash water and cool rinse. Others recommend using 2 cups white vinegar and 1 cup baking soda (I have not tried this and it may have a "foaming" reaction) to low or med wash load and let soak overnight. Wash as usual. you can also try storing them in airtight bags with activated charcoal sachets. Charcoal is great at removing the odour of smoke. After our house fire, we washed everything, being sure to follow up with a second washing using vinegar instead of laundry soap. Do not use the dryer. Instead, hang to dry in outside fresh air. Somethings we had to do several times before the smell was gone. What the best spray solution for removing smoke odor from a fire on clothing? I'd rather not have to wash them all if possible. Thank you. I am sorry to hear about the fire. I also had a house fire--back in 2001. You will have to wash everything, several times. Vinegar in the rinse cycle helps. Avoid using the dryer. As a firefighter, I can tell you that if you don't wash them, they will start to discolor. Smoke isn't just a smell, it is particles of the burned items. It will stain clothing over time and depending on what burned, can even weaken the fabric fibers. That is why we are required to wash our turn out gear on a regular basis. Avoid the clothes dryer--it can set the smell in. Line dry what you can and let it all air out good. Vinegar and baking soda are a huge help in the laundry. I have a family that had a fire and the smoke smell in the clothing will not come out. What can they use to get the smell out? I use 1 of 2 things. A product called Odor Check put out by Watkins. It works like a charm. Febreze. I use it on every thing including my truck (inside).